Remember when you were a kid, and you used to play Slug Bug? You’d be going somewhere in the family car, and you and your siblings or friends would be watching the road like hawks from the back seat. As soon as you saw a Volkswagen Beetle, you’d lean back and WHAM! let your neighbor have it by punching them in the arm, shoulder, ribs, neck, or wherever you thought you could inflict the most damage (aside from the obvious). In our family’s version of Slug Bug, if the person made a sound while being hit, you got to hit them again. I don’t know how many times we’d start a game of Slug Bug, and some time later I would find myself waking up in the waiting room of the local hospital. Man, little sisters can be vicious. I don’t know why, but for some reason Slug Bug only worked when you were in a car. Inside a car, belting someone for being the first to see a Beetle was fine; outside a car, it was considered assault and battery. I think even the hospital workers understood this. When they found out that I had been beaten unconscious in the back seat during a game of Slug Bug, they’d just nod knowingly and tear up the child abuse reporting form they were filling out. Remember how prolific the VW Bug used to be? Yet, despite the German zest for the, shall we say…autocratic, they were never considered the king of the road. Despite their lineage, Beetles just weren’t big enough, intimidating enough, or all-around serious enough for that. No, the Beetle was all about mob rule, but of a decidedly friendly sort. As a kid, peering out the car window at a cluster of Beetles surrounding you was like being licked to death by a dog; that is, provided there was no one wailing on you mercilessly at the time. In 1977 Volkswagen stopped selling Beetles in the U.S., and I think the game of Slug Bug gradually went dormant as the vehicles that once swarmed America’s streets, parking lots, and highways slowly dwindled. Or maybe I just grew out of it. Hard to know for sure. Of course, Volkswagen revived the Beetle in the late 90’s, and several years ago, my daughter introduced me to a game she learned from some of her school friends called Buggy Punch. She patiently explained the rules in the car one day, after suddenly exclaiming “Buggy Punch!” and hitting me on the back of my head. I listened as though it were all new to me, while simultaneously fighting off panic-filled flashbacks to my childhood. Anyway, this updated incarnation has a few unfamiliar wrinkles. One new thing to me is that you can hit twice for convertibles. Another is that after saying “Buggy punch,” you must say also say, “No punch backs,” or else the other person can claim the same Beetle and hit you too (again, twice if it’s a convertible). On the other hand, hitting someone over and over just because they vocalize pain is, much to my relief, not a part of the game. Other than that, it’s the same old Slug Bug. We’ve been playing ever since. It’s nice to have family traditions, isn’t it? 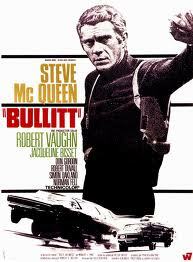 All this was brought to mind while recently watching the Steve McQueen movie Bullitt. During the film’s exterior scenes, I was struck again by the preponderance of VW Bugs on the streets in the 60’s and 70’s (although my direct memories only go back as far as the mid-70’s). 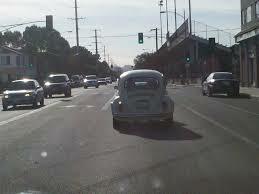 The sight of so many classic Beetles swept me right back to those nostalgic days of my childhood and Slug Bug. I think my shoulder even started to throb sympathetically. While I watched the film, an idea presented itself. Now don’t worry, I’m not going to recommend anything crazy, like watching Bullitt while driving (due to Slug Bug’s inside-the-car-only provision), although I guess the youngsters in the back seat could do it if they wanted to know what it was life was like for their parents’ generation. No, I came up with something which I think is a much better alternative. The rules here are pretty simple. Bullitt Slug Bug is emphatically not played in a car. Living room, back porch, man cave, tree house, dungeon, but not in a car. And don’t drink and drive. Really, what would “The King of Cool” think of you if you did? And now that I think of it, the tree house is probably not such a good idea either. As soon as you see a VW Bug appear onscreen, yell “Slug Bug!” The first person to say Slug Bug watches as everyone else takes a ‘slug’ of the designated beverage. The person who ultimately wins the Bullitt Slug Bug drinking game gets to draw big, bushy 70’s moustaches on all the passed out contestants with a Sharpie. Advanced version: the next day, the winner explains what happens in the rest of the movie to the losers (trust me, not as easy as it sounds, even if you were completely sober the entire time). The only hard and fast rule is Rule #1. Just as with the real Slug Bug, house rules can be implemented. For instance, some people might suggest that, depending on the beverage, and the company, it would be more fun if the first person to see a Beetle and say “Slug Bug” is the only one who gets to take a drink. Some might prefer to allow the winner to call out a person’s name, who then has to take a drink. Some might prefer to make it a guys-vs-girls thing. It’s your game; be creative. On that note, some people might be inclined to go so far as to combine the hitting, which is central to the original Slug Bug, with the ‘slugging’ of the Bullitt drinking game. Although I have no legal authority in this matter, I highly discourage you from attempting it. After a few drinks, someone’s going to punch someone in the arm, and the next thing you know it’s going to be Mortal Kombat 3D in your living room. Respect the game. You must be capable of recognizable speech for your response to count. You can’t point at the TV and blurt out “Schleegle Boogers” and expect to win. If you can’t say “Slug Bug” clearly, then you might as well go wash your face so it’s nice and clean for your new moustache. but by the time you’re halfway through the movie, you might be susceptible to trickery. Let’s keep things fair, people. If the designated beverage involves shots, you may want to line them up in advance. Things can really move fast once the rubber hits the road. VW Bug three times in ninety seconds (No, you are not that drunk yet. Three times. chase, although you may not remember much about the accident. You will have to decide whether or not to allow reviews of unconfirmed Beetle sightings. sightings is not out of line either. That’s it! Now all you need to play are some friends, some beverages, and a copy of Bullitt. Youtube offers it for a measly $1.99, but I can’t vouch for the quality. A quick check of Netflix shows it’s not currently available to stream (boo). I DVR’ed mine off of TCM. One last thing: please don’t make someone drink until they puke all over the host’s nice leather sectional (unless they are the host). And above all, remember: Always Slug Bug in moderation.